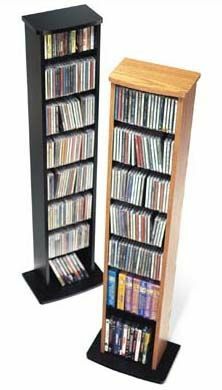 More on the Prepac CD DVD VHS Tower (Oak or Black) MA-0160 below. Fully adjustable shelves for easy arrangement and multi-size accommodation. *Accommodates up to 160 CDs, 80 DVDs, 40 VHSs, 104 cassettes, or any combination of the four. Available in a black or oak finish with a black base, interior and shelves.